Series of well ventilated cold frames. Cold Frames are an excellent low cost method for developing and growing young seedlings. Cold frames make a good alternative to the the cost and size of conventional greenhouses. To some extent you can make your own cheap cold frames. See this post – Home Made Cold Frames. I have just used a redundant double glazing unit to make a cold frame for my alpine plants. 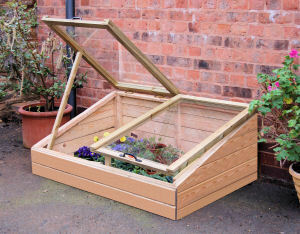 A good cold frame needs to have an easy mechanism for allowing air in. The cold frame can then be closed at night to protect seedlings against frost. This wooden variety helps keep the heat in. For best results keep at a south facing wall. The wood also makes quite an attractive feature for the garden. The only problem with cold frames, is that once you realise how useful they are, it soon becomes full and you start wanting a greenhouse! Of course, a cold frame can be an excellent choice for those who find the greenhouse overflowing at this time of the year.